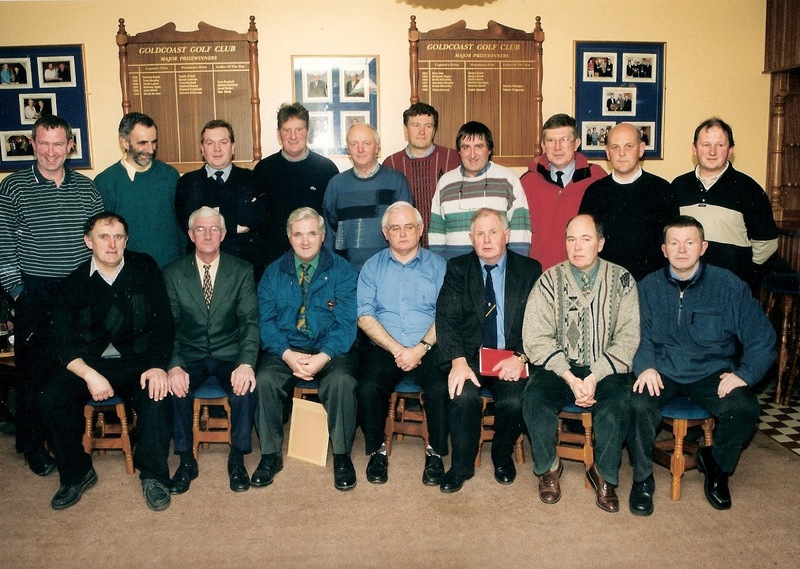 Back Row (L to R): Michael Collins, John Moloney, Michael Briggs, Greg Fives, Liam Enright, Michael Hanrahan, Séamus Fitzgerald, Frank Sweeney, Bernard Gorman, Patrick Ryan. Front Row (L to R): Tomás Ó Faoláin, Christy Phelan, Bernard Shields, Ned Keane, Tony Mansfield, Joe Cleary, Johnny Burns. This week's photo, taken at the Gold Coast Hotel in 2000, shows the launch a strategic plan for the development of football in the club. It has proven to be a huge success with numerous Western and County Football titles won in the intervening years. Our popular Jack the Joker Fundraiser will continue this Sunday night in The Stables Bar where the Jackpot will be €9,282. This week Niamh Briggs was drawn out of the drum but did not find the joker but did win €50 while Anthony Heavey and James, Jack and Joe Riordan won €25. We appeal to all our supporters to continue purchasing the tickets as the funds raised will go towards our ongoing development works at the club grounds. On Saturday evening last our Senior Hurlers played a very entertaining draw with Lismore in our fourth game in the County Championship. This result means that we are in with a chance of qualifying for the quarter finals heading into our last game against Ballyduff Upper where a win would see us advance to the knock out stages. TEAM: S. ENRIGHT, G. BREEN, S. BRIGGS, E. COLLINS, M. POWER, J. HURNEY, R. FOLEY, C. HICKEY, M. GORMAN, G. HURNEY, J. GORMAN, M. O’HALLORAN, S. CROTTY, P. HURNEY, M. FERNCOMBE. SUBS: S. O’HARE, C. KINDREGAN, T. HANRAHAN, J. PHELAN. Our Intermediate Hurlers completed their Championship programme of games on Friday last when we were defeated by a very good An Rinn side in Bushy Park. Despite losing the game results elsewhere mean that we will be in the Intermediate Championship again next year which is of great benefit to our young hurlers to help them make the step up to Senior Hurling. We would like to thank all of the players on this panel for the commitment they have given to the team this year and hope that they continue to train with the senior panel for the remainder of the year. TEAM: P. CASHIN, B. LOOBY, J. MOORE, D. HENLEY, E. BERGIN, R. DUNFORD, S. O’DONOVAN, D. COLLINS, J. POWER, D. HICKEY, L. HURNEY, C. KINDREGAN, N. DEE, S. SLATER, C. MOLONEY. SUBS: R. SHEEHAN, J.P. McGRATH. On behalf of all in the club we would like to wish Stephen Slater the very best of luck as he heads off to the USA to take up employment. Stephen was captain of our Intermediate hurling team this year and will be greatly missed off the adult club teams for the remainder of the season. Any member who wishes to order tickets for the Munster Hurling Final must have their order with Bernard Shields by July 2nd at 6 pm. We would like to wish the Waterford Senior Footballers the very best of luck ahead of their All Ireland Qualifier game against Wicklow this Saturday in Aughrim. Our club bingo will continue in the CBS Hall this Sunday night where the Jackpot is €950. Our under 12’s travelled to Youghal last Thursday evening to play in the final let of the U12 Town and country league. Our boys played very well and recorded a comprehensive win. We played Cois Bhride last Saturday morning in Tallow in very wet and windy conditions in the second round of the U14 hurling championship. This was a close match through out and we were 1-4 to 1-2 down at half time. Credit to both teams that battled through the conditions with our lads finishing the stronger to record a 3-4 to 4-5 win. Next match in this championship is against De La Salle on 30th July. Panel: Seamus Ryan, Aaron Beresford, Jack Kiely, Shane Ahearne, James Beresford, Padraig Moore, Bearach Moore, Gearoid Hallinan, Tom Looby, Neil Montgomery, Patrick Power, Ryan Daly, Darragh McGrath, Sean Crotty, David Montgomery, Mark Twomey. We play Dungarvan in Abbeyside and Kilrossanty in Lemybrien next Monday evening 2nd July in the 3rd rounds of the Under 13 championship. Well done to Sean Crotty, Tom Looby, Geariod Hallinan who represented the club in the western Larry Quinn skills competition in Bushy Park last Wednesday evening. Sean finished 3rd and now goes on to the County finals. Training continues every Friday evening weather permitting for all age groups from 6-30 to 7-30 new members are always welcome just come along any Friday evening. Help is always needed and if any parent would like to get involve just come along any Friday evening. As we go to press our under 12s will have played Cappoquin at home these are a great bunch of girls who are improving with every game and getting and giving great enjoyment. Our clothes collection goes ahead this coming Friday & Saturday the 29th and 30th of June bags can be dropped to club grounds from ten o clock on Friday. All clothes that can be reused will be accepted. The joker fund raiser continues every weekend with the jackpot now over €9,000 this fundraiser helps to go to club development anybody who has been in the club grounds over the last few weeks will see the improvements made to club grounds. Back Row (L to R): S. Leahy, J. Hayes, J. Waters, P. Burke, S. Crotty, M. O'Connor, P. Whelan, L. Whelan, T. Murphy, M. Cashman, M. Grant, J. Curran, S. McGrath, J. Kiely, J. Grant, M. Foley. Front Row (L to R): J. Fraher, J. O'Connor, T. Ryan, S. O'Brien, M. Clancy, A. McGovern, D. O'Connor, S. Callaghan, J. Duggan. Seated in Front (L to R): M. Hayes, M. Burke. This week's photo shows the Abbeyside Junior Hurling team from 1946. The players pictured here were the first to wear the blue and gold hooped jerseys which all Abbeyside hurling teams have worn since. 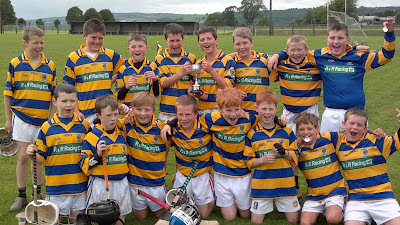 A promising campaign ended with a 3-3 to 1-2 defeat in the County Final to Butlerstown at the Gaelic Field in Waterford. Our popular Jack the Joker Fundraiser will continue this Sunday night in The Stables Bar where the Jackpot will be €9,000. This week Emma Murray was drawn out of the drum but did not find the joker but did win €50 while Kevin O’Brien and Philly Connors won €25. We appeal to all our supporters to continue purchasing the tickets as the funds raised will go towards our ongoing development works at the club grounds. On Saturday evening last our Junior Footballers scored a resounding victory over Geraldines at Fraher Field in our second game of the Western Championship to remain unbeaten in the Championship. This Saturday evening we take on Lismore in Fraher Field at 7:30 pm in our fourth game of the County Championship. On Friday we play An Rinn in our last game of the League Section of the Western Championship in Bushy Park at 7:30 pm. On behalf of all in the club we would like to congratulate Richie Foley and all the Waterford senior hurlers on their great victory over Clare on Sunday last in the Munster Senior Championship. Our club bingo will continue in the CBS Hall this Sunday night where the Jackpot is €900. Our under 9’s travelled across to Dungarvan last Saturday to play an under 9 blitz in the Richie Harty Memorial. There we played three good and challenging games against Midleton, Killeagh and Dungarvan and the boys gave a great account of themselves where we excelled in all three matches. Following the event, Alan Harty made the presentation of medals to the players. Many thanks to David Burke for the invite and well done on a well organised event. Thanks to all in Dungarvan GAA for the tea & sandwiches and their kind hospitality afforded to players, coaches and supporters. Hurling training on Wednesday evenings at 6.00pm – 7.30pm. Friday evening match versus Ballygunner at Abbeyside at 7.00pm. Teamers will be sent out for each session. Parents are asked to reply to the teamers after each text as each team are only allowed a certain number of free teamer texts. Upcoming fixtures Monday 23rd Under 14 away to Cois Bhride. Our under 11’s were invited by Lismore to play in their annual Ber Ryan hurling tournament. We played De La Salle and Fr. O’Neills in the first two rounds, we played well here to record two wins and went on the play the hosts in the final. This was a tremendous game on hurling with very little between the teams at half time, Lismore leading 3-0 to 2-2. In the second half our lads started in tremendous fashion and play excellent hurling with everyone playing their hearts out. This skill level on both teams was very high for this age group. The Abbeyside boys finished strong to record the win. This I suspect will be the first of many great battles between these two teams in the coming years. Well done to both teams and all the parents that were there were treated to a great game of hurling. We would like to thank Lismore for the invite and for the refreshments and catering on the day. Panel: Michael Kiely, Eoin Ahearne, Senan Travers, Cian O’Riordan, Sean Roche, Patrick Fitzgerald, Oisin Hallahan, Ethan Raher, David Hayes, Jamie Power, Darragh Slevin, Jack O’Riordan, David Kiely, Colin Foley, Niall Buckley, Sean Sullivan, Alec Norris. Well done to Caoimhe Dwyer and Séan Crotty from Abbeyside NS who played Primary Game on Sunday last. This was a fantastic achievement for Caoimhe and Séan. Well done again. Congratulations to Abbeyside NS who capped off a fantastic year by winning the County A hurling championship against St. Declan’s. The boys already won the Western hurling, Western and County football and mini 7’s in hurling and football. This is an incredible achievement for all the boys involved and great credit should also go to the teachers involved in the training of these teams. On Tuesday evening last our U12's travelled to Carrick-on-Suir to play league against St. Mollerans. Good experience was gained from this game and well done to all girls involved and to the supporters who braved the elements to travel with us. We would like to wish Sarah Wright a speedy recovery from the injury she picked up at training. Hopefully you'll be back on the pitch soon. Training continues for all groups on a Friday evening from 6.30 to 7.30. On Friday 29th and Saturday 30th June we are collecting good quality second hand clothing suitable for re-use. Please use this as an excuse to do a clear out and fill as many black bin bags as you can. For further details contact Claire Cosgrave on 087 7449964 or Claire Regan on 087 6680366. This week's photo shows Tony Mansfield presenting the Higgins Cup to Martin O'Donnell at the old club grounds in the mid 1970s. 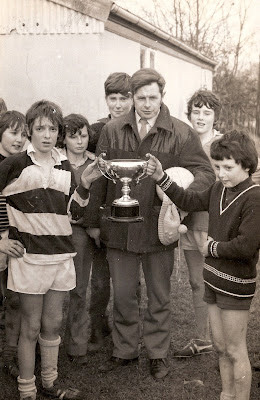 He received the trophy following his team's victory in the club's U14 Parish Football League. Our popular Jack the Joker Fundraiser will continue this Sunday night in The Stables Bar where the Jackpot will be €8,650. This week Jonathan and Kevin were drawn out of the drum but did not find the joker but did win €50 while Nora Tobin and Eoghan Cosgrave won €25. We appeal to all our supporters to continue purchasing the tickets as the funds raised will go towards our ongoing development works at the club grounds. On Friday evening last we played a draw with Passage in Passage in our third game of the County League as the full time score was 2-12 each. The next meeting of the club is on Thursday night next, June 21st at 8pm in The Parish Office. Our club bingo will continue in the CBS Hall this Sunday night where the Jackpot is €850. On behalf of all in the club we would like to send our sympathies to the family and many friends of the late Geraldine O’Donoghue, Strandside who passed away last week. Geraldine’s sons Frank and John played for the club in the past and we send our sympathies to them along with Geraldine’s husband Jack and to her daughters Geraldine, Margret and Mary. Kellogg's Cúl Camp will be taking place in our club from the 2nd to the 6th of July. It starts each morning at 10am and finishes at 2.30pm. Applications are still being taken and this can be done online or application forms can be given to Carmel who can be contacted on 0872598923. Best of luck to Séan Crotty and Caoimhe Dwyer from Abbeyside NS who; will be representing Waterford in the Primary Game. They will be playing at half time during the Waterford – Clare game this Sunday. This is a great achievement for Séan and Caoimhe and hopefully one of the many times they will represent their county. After a quiet few weeks, the under 9’s played a few matches in the last week or so. First up our under 9’s got invited to play in the Ballyduff under 10 tournament where they won one game and were beaten by only 3pts and 1 pt in the other two matches. It was a terrific team performance against the under 10’s which no doubt will stand to them for next year. We also travelled out to Brickey Rangers to play few matches which was followed by up by a trip to Youghal GAA Club to play an under 9 blitz last Saturday. We had 2 teams of 10 under 9 players represent the club which saw them each play games against Cobh, Fermoy and Youghal. Both teams gave a great account of themselves and all enjoyed a great mornings hurling. Many thanks to all the parents and supporters who travelled and supported the teams. Many thanks to Alan Geary from Youghal GAA for the invite and for the party bags, tea and sandwiches served afterwards in their beautiful clubhouse. May we wish Sean Lanigan a speedy recovery after he sustained a wrist injury last week and we all hope to see him out again shortly. Best of luck to all of our club members who are currently doing their Junior and Leaving Cert. Training continues for all groups on a Friday evening from 6.30 to 7.30, U12's have a league match at home this Thursday evening against Tramore at 7 pm. A clothes recycling fundraiser is being rolled out by the County Board and Clubs will have an opportunity to raise much needed cash through this initiative. We are making a request that you hold onto your old clothes, shoes, bags, etc and donate it to club when the time comes around. More info to follow. Back Row (L to R): Michael Fives, Dan Casey, Johnny Byrne, Greg Fives, Paddy Coyne, Séamus O'Brien. Front Row (L to R): Lenore Byrne, Mai Feehan, Margaret Cashin, Margaret Enright. 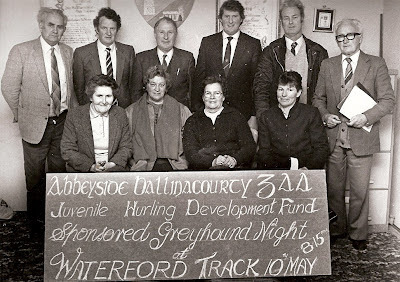 This week's photo, taken at the club grounds in the early 1980s, shows a committee of dedicated club members promoting a greyhound night in Kilcohan Park, Waterford to raise funds for juvenile hurling in the parish. Fundraising has always been critical to the promotion of our games and we are grateful to all involved in this task. Our popular Jack the Joker Fundraiser will continue this Sunday night in The Stables Bar where the Jackpot will be €8,350. This week Pat and Ashling were drawn out of the drum but did not find the joker but did win €50 while Shawn Hallahan and Ann Kelleher won €25. We appeal to all our supporters to continue purchasing the tickets as the funds raised will go towards our ongoing development works at the club grounds. On Saturday last were defeated by The Nire in the County Championship on a score of 1-13 to 1-05. TEAM: S. ENRIGHT, M. LAVAN, J. PHELAN, J. HURNEY, S. BRIGGS, P. LYNCH, R. FOLEY, S. O’HARE, R. SHEEHAN, J. POWER, P. HURNEY, J. O’MAHONY, M. O’HALLORAN, M. FERNCOMBE, M. GORMAN. SUBS: M. FIVES, G. HURNEY, G. BREEN. This Saturday we play Passage at 6:30 in the County League in Passage. On Sunday last we maintained our unbeaten record in the Western Championship with a comprehensive victory over Ballyduff in Fraher Field. TEAM: R. RYAN, D. HENLEY, J. MOORE, M. POWER, N. DEE, T. HANRAHAN, D. COLLINS, C. MOLONEY, R. DUNFORD, S. CROTTY, L. HURNEY, S. DELAHUNTY, E. COLLINS, S. SLATER, S. O’DONOVAN. SUBS: E. ENRIGHT, A. LANDERS, C. HICKEY. We played out a very entertaining draw with Ballinameela on Friday night last in Bushy Park in what was our first game of the Championship. TEAM: J.P. McGRATH, C. HICKEY, C. BARRETT, C. O’DWYER, E. CASHIN, P. CASHIN, A. LANDERS, J. HEALY, E. ENRIGHT, L. SHEEHAN, N. BURKE, E. HENNESSY, J. ORGAN, I. KIELY, F. McGOVERN. SUBS: W. FENNELL, D. SHEEHAN. The May Deise Draw took place last week and on the night we had great success as Pat Moore won the first prize of €10,000. Our club bingo will continue in the CBS Hall this Sunday night where the Jackpot is €800. We travelled to Ballyduff last weekend to play in the Division 1 semi final of their hurling tournament which is run on a yearly basis. Our semi final was against Lismore and even though we played well, it was our opponents who ran out winners in the end. We then played in the Shield, where our opponents were Fermoy. Our lads upped the tempo in this game and we had some very good performances and ran out good winners. We then played De La Salle and again our team played very well to reach the final in the Shield. Our opponents in the final were St Catherine’s from Wexford and this was a good game. Our lads fought hard and played well to run out deserved winners. Well done to all the players over the two weekends:Daniel Treen, Sean Sullivan, Jamie Moylan, Colin Foley, Daire Slevin, Niall Buckley, Eoin Flynn, Ronan Foley, Tadgh Collins, Tony Dwyer, D J Kiely, Jack Riordan, Ben O Donovan, Alec Norris. We would like to thank Ballyduff for the invite as it is a very well run tournament and no doubt we are seeing some county hurlers of the future. We have several tournaments coming up over the next few weeks with football starting next Wednesday evening, details will be sent by teamer. Our under 13’s travelled to Dunhill Saturday morning to play in the Football county final against Gaultier. This was a very competitive match, we had to play into a breeze in the first half and despite having a lot of possession we trailed at half time 0-3 to 0-1. We started the second half with a lot of determination; we matched Gaultier point for point. We took a further setback half way through the second half when Gualtier got a goal to put us four points behind; 1-5 to 0-4. A bit like the Western final our lads really dug deep and got three quick points and followed this with a goal of our own and finished winners 1-5 to 1-9. This was a great team win where all of the panel played their part. This was the first under 13 county championship for the club since the under 13 championship structure changed last year. A word of thanks to all the parents and supporters who travelled to Dunhill and back to McDonalds afterwards for the celebration. Panel: Aaron Beresford, Tommy Walsh, Shane Ahearne, Sean Whelan Barrett, Sean Crotty, David Montgomery, Mark Twomey, Padraig Moore, Bearach Moore, Gearoid Hallinan Capt, Tom Looby, Jack Kiely, Jamie Walsh, Shane Kiely, James Riordan, Daithi Brunnock, Fionn Gibson Kiely, Ben Flynn, John Power, Johnny Treen, Dean Beresford. There is no rest for the under 13 players as they will have played the first round of the Under 13 western hurling Championship by the time of reading these notes (both divisions) on Monday evening 4th against Brickies and Ardmore. Our Under 14’s played Ardmore in the Western Hurling semi (div 3) last Wednesday evening. With this fixture clashing with the county finals of the primary schools running and with one or two players sick we had the bare 13 players. We played very well into the wind but in the second half we conceded a number of goals and Ardmore came away with the win and proceed to the western final on 16th June. This was great experience for a lot of our younger players and will benefit them in the future. Panel: Padraig Moore, Bearach Moore, Tiernan Fagan, Jamie Walsh, Tommy Walsh, Jake O’Riordan, Fergal Roche, Shane Kiely, James O’Riordan, Johnny Power, Meldan Dwyer, Sean Kent. Under 14 Western Hurling Semi Final Div 1 on in Lismore - Wednesday 6th. Under 14 Hurling first round of championship at home to Lismore - Monday 11th. Our under 11’s played Lismore, in Lismore in the Town and country league last Monday. This was a tremendous game of hurling throughout, there was nothing between the two teams all the way, in the end Lismore held on for a one point win 3-8 to 3-7. The positive thing is we were invited back to an under 11 tournament hosted in Lismore on the 16 June. We play Youghal in the final round of this league on Wednesday night. Panel: Michael Kiely, Eoin Ahearne, Senan Travers, Oisin Hallahan, Patrick Fitzgerald, David Hayes, Sean Roche, Michael Troy, David Roche, Cian O’Riordan, Ethan Rahar, Jack O’Riordan, David Kiely, Colin Foley. Generally, hurling training on Wednesday evenings at 6.00pm – 7.00pm and Friday evening training from 6.00pm to 7.30pm.Teamers will be sent out for each session. Parents are asked to reply to the teamers after each text as each team are only allowed a certain number of free teamer texts.